Located at 130 km from the capital city, this park is an Argentine Natural Landmark which portrays a stunning beauty. This park covers great part of Tafí del Valle, in lesser extent, Trancas and Tafí Viejo. It covers the summits above 3,000m above the sea level. 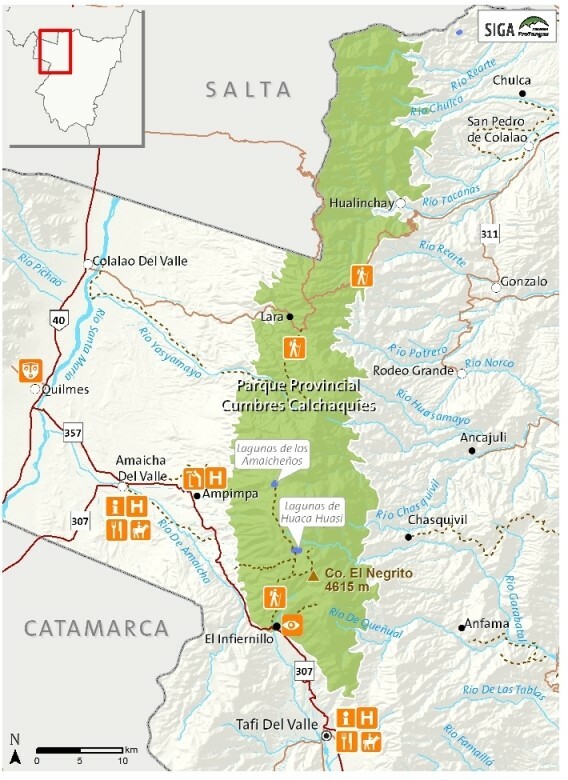 It connects El Infiernillo with Pabellón Hill Summit up to the border of Salta. It is the biggest protected area in the province and it covers 80,000 hectares. Operation bases are located in Tafí del Valle and Amaicha del Valle where different excursions can be taken. Some tourist options are walks and tours with professional tourist guides who will tell the History from another perspective. Tourists will be able to see mammal fossil remains and the petrified carob trees forests. Numerous animals, for instance, partridges, flamingos, Andean cats, pumas, guanacos make this park a special place to visit. Weather turns dessert whereas winters are dry. Summers are warm with high temperatures during the day.